Space Coast Beach Buzz: Here's looking at you, kids! I don't think visually, so when an image lingers in my mind, it's a strong one. 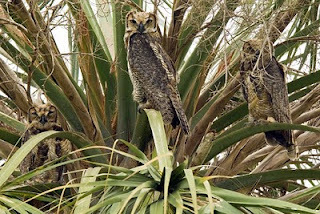 That's the way I felt about Charlie Corbeil's photo of these Great Horned Owl chicks. After a day of seeing them in my head, I asked Charlie for permission to share the photo and for some details. 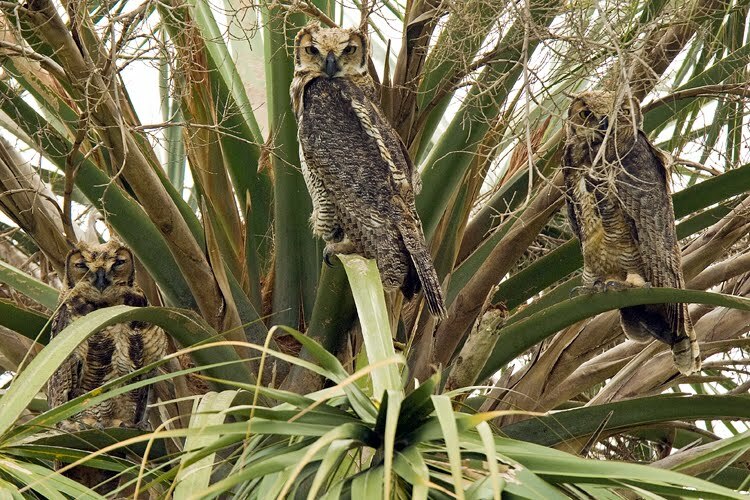 If he is in town, Charlie is at Viera Wetlands every morning and every evening, and this was his first sighting of a Great Horned Owl there. He tells me that the soft, light feathers on their foreheads identifies them as chicks. He says they were quite large, and he figures they flew from their nest tree to this palm tree. He first saw them last weekend while he was walking the roadway early in the morning . (Click on the photo to enlarge so you can spot the third chick.) They were still in the same position, same tree that afternoon, but gone the next morning, confirming his suspicion that they fledged their nest and were trying out their wings. He didn't ever see any adult Owl supervision. 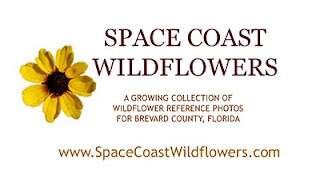 If you have not visited Wayne's Space Coast Wildflowers blog lately, be sure to do so - he added three new posts yesterday about beach wildflowers. Somehow, many of us think of the beach as a stretch of bare sand, but it's ever so much more. Wonderful owl fledgling image! Interesting that they sat there for so long. Such a fun find in a wetland.